It really feels sad to post a story like this. But I've to post this to bring the truth of the commonwealth games preparation, facilities given to the athletes and how false promises are made to take the credit or for vote bank politics in India. This story is of a women athlete who won a gold medal in the 2010 commonwealth games, held in New Delhi, India. The name of the athlete is Anisa Sayyed from Pune. She won 2 gold medals in the shooting competition. 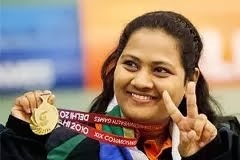 On her winning two gold medal the then Chief Minister of the state of Maharashtra promised her a Class I government job. But in the last three years, there is no progress in this matter, despite being several communications made with concerned authorities. The shooter is currently without a job yet preparing for the 2014 commonwealth games to be held at Glasgow along with some other international sporting events. I hope that the concerned authorities will fulfil the promises made and the athlete can better focus on her training stuff etc. rather than requesting for job. India achieved the record second position in the medals tally in the 2010 commonwealth games that were held in New Delhi, India. This was the first time India won so many medal in the games history, however it'd be difficult for India to repeat this success in the 2014 Glasgow competition. India is expected to get around 30 to 50 less medals this year. Reason for this is that many of the games that India won gold, silder or bronze medals are not included in the games this year. This means that there will be a serious impact on the overall medal tally for India. However this just sounds like an excuse for a country of more than 100 millions population. A country must be competitive to win each and every competition they particiapte and not only the ones they won medals previously or regularly. My suggestion to Indian authorities is to stop wondering about what has already happened and could not be changed. Just focus hard on the sports person, provide them the training etc and get them ready for 2014 Glasgow commonwealth challenge. My best wishes for all the teams and sportsperson representing India in Glasgow commonwealth games. Located at Tollcross Park in Glasgow’s East End, this simming centre has been upgraded recently with competion, recreation, training and fitness facilities. There is a capacity of 2000 spectator seats. This will host squash, table tennis games. Has a facility of 2500 seats for spectators alongwith gym, pool, TT, Badminton courts, running track, fitness centres etc. Kelvingrove Lawn Bowls CentreFor Lawn bowls competitions, this centre has been upgraded recently. 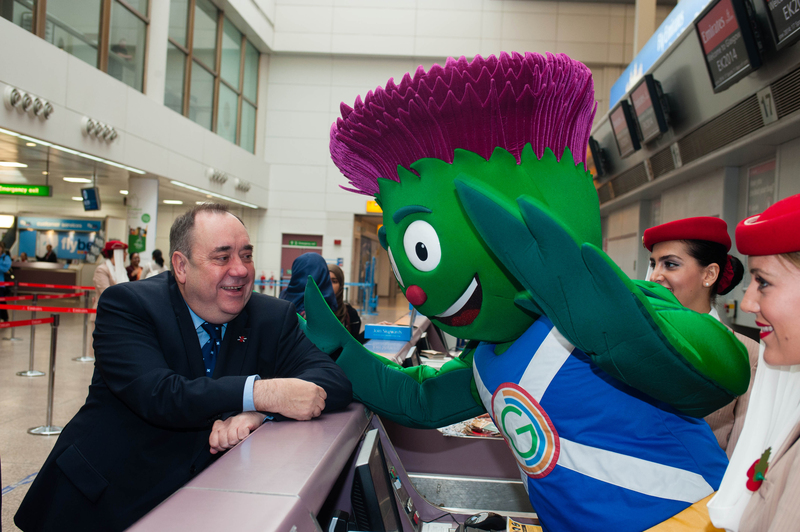 Glasgow Commonwealth Games mascot called Clyde is now one year old and this Mascot will officially represent the face of the 2014 commonwealth games. Chances are there that for next few months till the tournament will start and end you can see the Clyde mascot all over Scotland and over print media, television and internet. Same for the case for New Delhi Commonwealth games held in 2010 where Shera the official Mascot was seen all over India, specially Northern part of the country. As I told Clyde is one year old and unlike other babies Clyde has been busy whole year spreading the word about the games. Image below shows one such promotion for Clyde. Internal board dispute has caused Pakistan hockey team not to participate in the 2014 commonwealth games. Though this is not a good news for a country like Pakistan where game is quiet popular and people connect emotionally to the game. What happened is that the Pakistan Olympic Association got split into two bodies and only one of those by recognised by IOA. The Pakistan Hockey Federation backed by state sports authority thus showed no interest in POA that has IOC backing and decided not to send the hockey team. Interestingly the Pakistan hockey has failed to qualify for hockey world cup as well. I wish the disputed in the country get resolved soon and we'll need to seethe country doing well in hockey as they did in the past. Pakistan hockey teams exclusion came as a good news for T&T hockey team. For a board who is facing financial crisis, participating in such a world class tournament would not only help financially but would be a learning curve for the team as well. The 11 day sporting event called Commonwealth Games will start on 23 July 2014. The popularity and craze for the people for the games is such that for popular sporting events like diving, swimming, athletics, cycling, gymnastics, judo, shooting etc the tickets has been oversubscribed. Thus tickets would be allocated via a draw. If you check the link http://www.glasgow2014.com/tickets/ticketing-explained you can get a clear idea. Now all the tickets enquiries has been closed. The lucky ones to get the tickets would be informed by the authorities about further process. Further on the day of event the public transport would be free of costs. So there no hurdles in reaching any of the indoor or outdoor stadiums to enjoy the favourite events. Prices for all the event tickets would be £15. Anyone under 16 or above 60 years of age will get half prices tickets for the events. As mentioned above local transport would be free. Special arrangements are done for disable people to enjoy the game and one can get wheelchair space subject to availability. This was all about tickets, I hope you’d get the one for you. Other news from Glasgow is that all the road works for the sports village are expected to get completed 4 months advance of the event. Hotel costs for the events has increase multiple times and one can expect the hotel to be costlier by more than 1000% till the Commonwealth games are as compared to other normal days. Would update you about baton relay and other updates of the event soon. Keep visiting. If you are a professional photographer then this can be a dream assignment to you. Commonwealth Games organisers are looking for photographers (photo journalists) for a six months assignment. The photographers selected will travel along with the Queens Baton relay across various nations. Getting paid for a trip that will start from India in October 2013 and covering nations like Maldives, Australia, Africa, Dubai etc and then reach Ireland (Glasgow) the host country for the Commonwealth games 2014. Last day you can apply for this job is 16th September and if selected you must be available to start the work on October 1st. You can apply for this job at the official commonwealth games 2014 site. Queens Batons is just as famous as the Olympics torch and it travels across the globe through various participating nations. We’ll keep you posted about the excited journey of Baton. Please keep visiting this blog for further updates.